The weather these last few days have convinced me that we are officially out of summer, into autumn, and very quickly on our way to winter. I love this time of year because the scarves and gloves come out and so do the “warm you up” recipes — my favorite! Nothing beats a big bowl of chili, soup, or stew to warm your bones on a cold rainy day. This recipe is no exception! 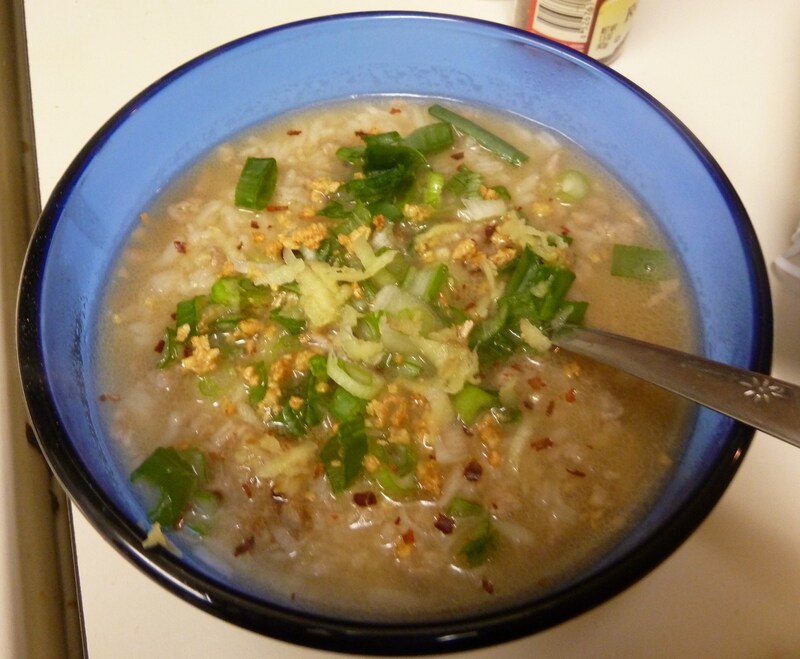 Cory and I absolutely love khao tom moo (rice porridge soup). It is the easiest of recipes (which means you can’t mess it up!) but the flavor is divine and on a scale of 1-10 on the “warm you up” scale, it’s definitely a 10! Another added bonus? It’s super inexpensive with only a few simple ingredients going a long way. The base is really just chicken broth, pork and rice with an optional egg. It’s the garnishes that truly make this dish though. My favorite combination is a sprinkle of fried garlic, a handful of cilantro, red pepper flakes, and a dash of white pepper. The flavor combo is fantastic! My favorite part about this recipe though is that it tastes even better as left overs. The longer this soup sits (whether on the stove or in your fridge) the more the rice breaks down and creates that yummy porridge consistency. You can start with a nice rice soup for dinner (more of a broth base with pork and rice) and end with a creaming porridge for breakfast. So delicious. You cannot go wrong with this recipe — give it a shot and let me know what you think! Heat vegetable oil in a medium size pot on medium-high heat. Add garlic, stirring constantly until garlic is yellow. Do not burn. Then, remove half the portion and set aside for garnish. Stir meat into remaining oil and garlic and cook until no longer pink. Add salt and soy sauce and mix well so the meat absorbs some of the soy cause. Pour in chicken broth and jasmine rice and let it cook on medium-high heat for 3 to 5 minutes. Longer cooking will result in a more porridge-like consistency. Note: At this point, you can remove from the heat and garnish with fried garlic, ginger, green onion, cilantro, and white pepper powder. Or, if you’d like to incorporate the egg, follow the rest of these directions. Stir the egg into the soup or let it poach. Once cooked (30 seconds to one minute) remove from heat and garnish. nice recipe, been looking for this healthy breakfast since I tasted it in Thailand.